Posted November, 2018 by admin & filed under Dental Care. For most people, dental care means extracting an aching or decayed tooth and replacing the same with a false tooth. While this is quite a true picture of what a dentist generally does as part of his every day life, there is much more to dentistry. Depending upon complexity, any job can be divided into two categories: basic and advanced. Because of the complexities involved, replacing lost teeth can be placed in the advanced category. One of the most advanced forms of dental care in Lusby, MD is dental implants. Dental implants are false teeth that are as close to natural teeth as anything can get. They have been around since the 1980s, but their use has not been so widespread until recently because of the high cost. A single implant can set one back by $3,000 and a whole set implants can cost between $24,000 and $100,000. Although some of the cost can be covered by insurance and the rest by financing, it is the sort of money most people cannot afford. Still, for those who can afford, they are the best alternatives to natural teeth. Dental implants are titanium screws that are surgically implanted on or in the jawbone to replace lost teeth. The surgery is treated like a major surgery and carried out in the presence of a full surgical team. Titanium is a metallic-white metal that is as strong as steel and also lighter and more ductile. It is also good at fusing with the bone. There are two types of implants. The older type, called subperiosteal, is implanted on the jawbone. The metal framework can be seen jutting out of the gums. This type of implant is used for patients who have inadequately low jawbone height. The newer and more advanced type, called endosteal, is implanted in the jawbone. This is the type of implant used widely these days. Dental implants come in two shapes. The root form implant is shaped exactly like the roots of the teeth, while plate form implant is flat and long. The former requires plenty of width between adjacent teeth and also a good jawbone height. The latter is made to squeeze into a narrow jawbone. Once the implants are surgically implanted, they are left alone for a few months. After they are completely healed, another surgery is performed to place prosthetic crowns on top of the implants. A single dental implant can hold several crowns. To replace several or an entire set of teeth, dental bridges or dentures are permanently fixed to the implants instead of crowns. Dentals implants have a 95% success rate and last a lifetime. They do not only look like natural teeth, they also feel like natural teeth so that the patient hardly ever feels any difference with eating and speaking. Another good thing about dental implants is that neighboring teeth do not need to be touched or altered to keep them in place. This saves them from long-term damage. 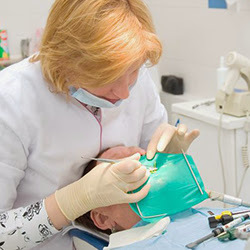 Dental care in Lusby, MD is well known for high quality dental implants. Visit us for quality dental care today!